Here we are in the polite western suburbs of Bury St Edmunds, not that far from the town centre really in the great scheme of things. 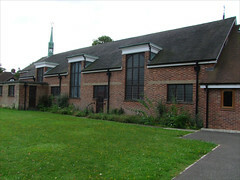 And All Saints is a polite brick building, put up in 1962 to the designs of Cecil Beardsmore Smith. 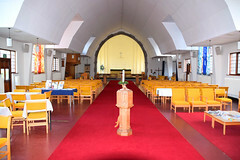 It replaced an earlier hall to the west, and this was probably the reason that he ignored the modernist tendencies of the time, matching the hall into what is otherwise indistinguishable from many schools and churches of the time. 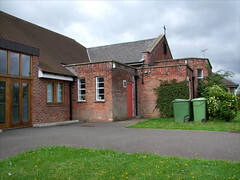 In 2007, the space between them was infilled, creating a large, single multi-purpose building. 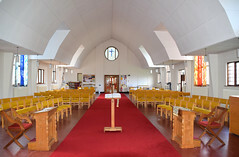 The church is longer than it appears from the outside, probably because of the tall dormer windows, and the early 21st Century reordering was carried out with intelligence and style, the yellow chairs and the illuminated apse creating something of a cinema effect. 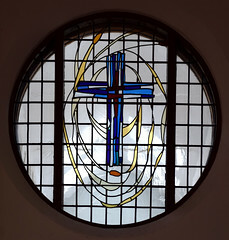 A circular window above the west doorway into the extension contains glass which looks as if it might be Surinder Warboys, depicting a cross and a stream with bullrushes. 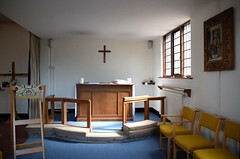 A side room to the south of the sanctuary acts as a lady chapel, and is probably what the parish uses for its day-to-day worship. 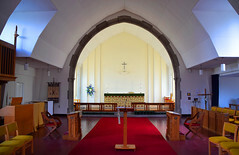 And that would be it, I suppose, were it not for the fascinating detail that the lady chapel had an altar piece by the great Ellen Mary Rope, one of that great family of Suffolk Arts and Crafts artists whose work can be found in a dozen churches across the county and, of course, far beyond. 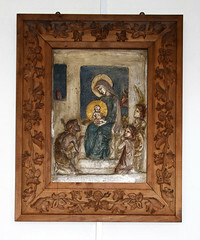 It depicts the adoration of the shepherds and angels, and has since been reset on the side wall. 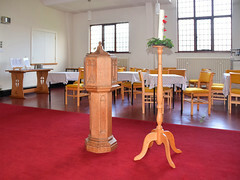 Back in the 1980s, Sam Mortlock found an oak lectern which he described as being of 'some character'. 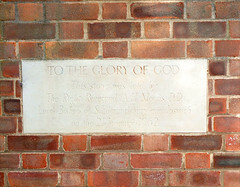 It had a Greek inscription below the eagle (he doesn't say what), and <i>CJC 1939</i>. 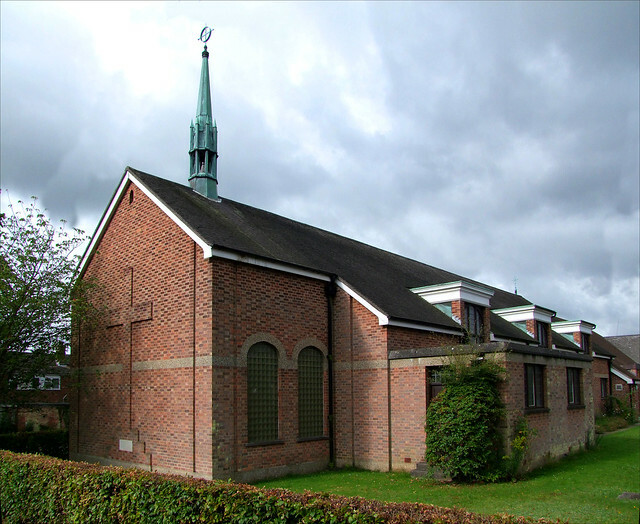 If that was the date of its dedication, then perhaps it came from the old hall church next door, and gives us a date for its construction. But it is no longer here, so I wonder what happened to it?